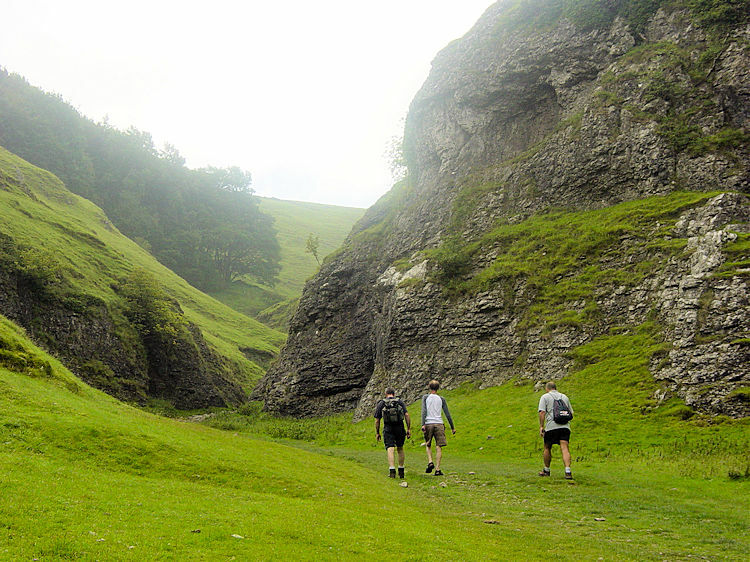 Summary: Probably the most popular walk in the Peak District. 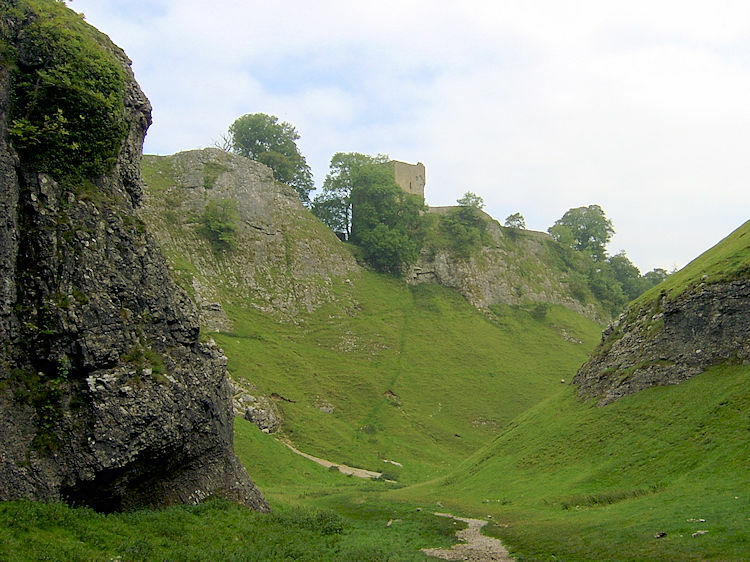 This route from Hope takes us to the neighbouring village of Castleton and then onto the Limestone Way via Cave Dale. 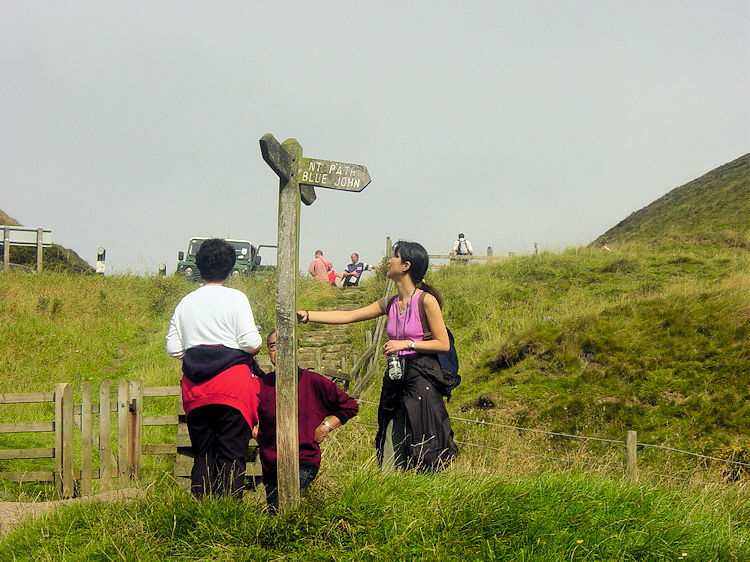 After leaving the Limestone Way at Old Moor the path turns north towards Mam Tor. After climbing the very popular hill the walk continues along the super and appropraitely named Great Ridge which overlooks the Hope valley. After two miles along the ridge drop back into the valley and return to Hope. The spectacular September weather continued into our third day in the Peak District. And today was the hottest of them all, warm even at 9.00am as we set off for the drive from Buxton to Hope. 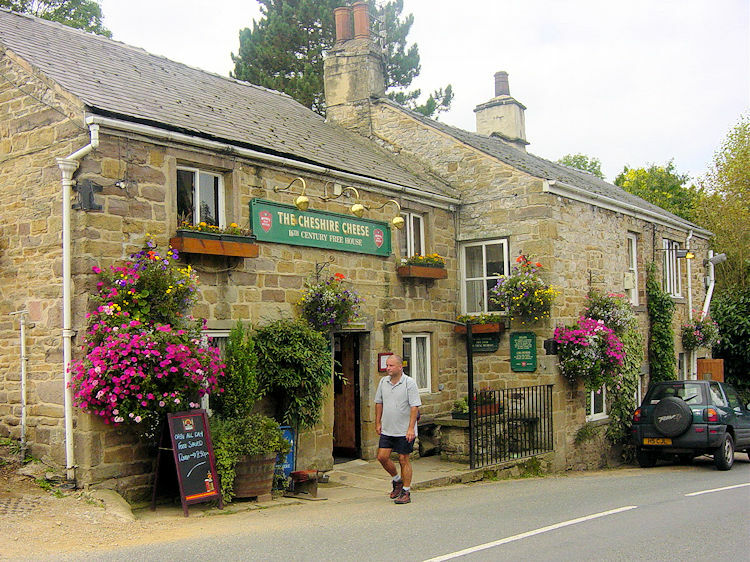 Today's walk was one of the Peak Districts most popular walks in the Hope valley, probably the most popular area of the National Park. Hope and it's neighbouring village of Castleton are always busy in summer, more so when the weather is as good as it was today. We expected crowds. We set off walking from Hope and as we walked over to Castleton the sound of cars was constant as they filled the valley roads. Fortunately for our aching ears we left the noise of traffic after Castleton by following the path which led past Peveril Castle and through Cave Dale. 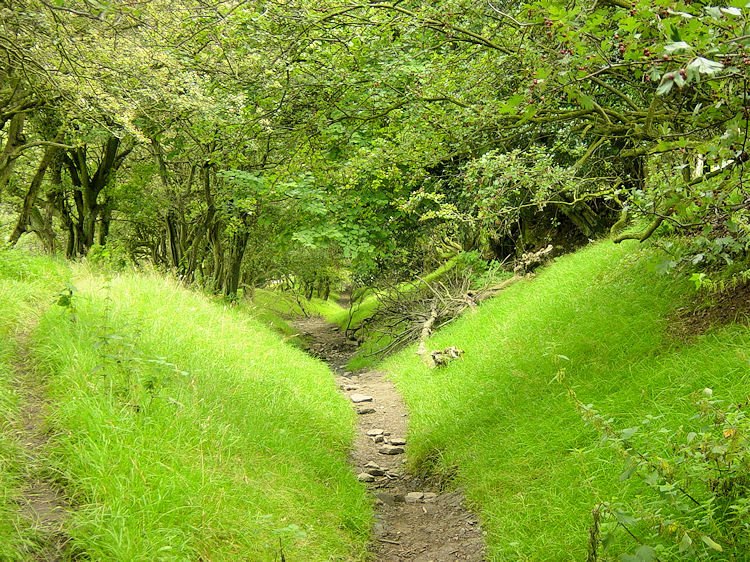 Beyond the narrowest part of Cave Dale we began ascending to the Limestone Way by way of Old Moor. The climb to Old Moor was steep and Dave's leg pain quickly returned during the ascent. He struggled valiantly as he had done so on the two previous walks but it was clear he was getting fatigued more easily now. Fortunately the pain was alleviated someway by the thrilling limestone escarpments on either side of the walk up the pass to Old Moor. 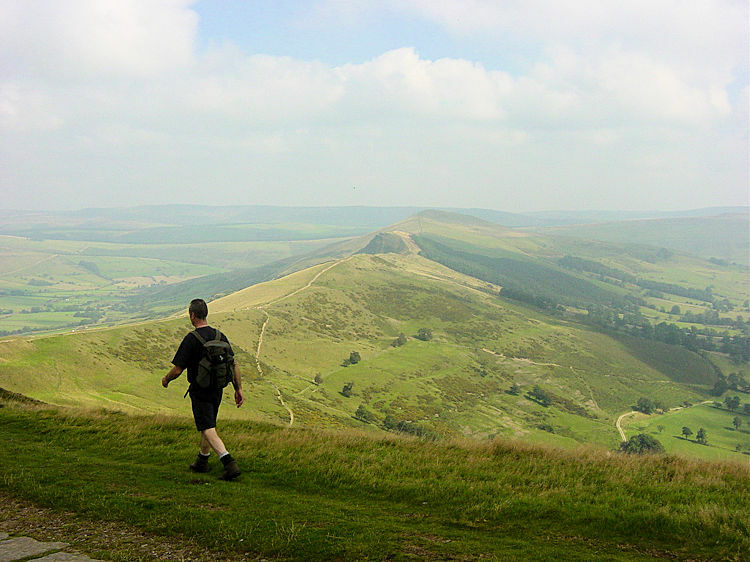 At the top we walked up a bridleway until we gained views of the Mam Tor ridge. Once the views were available to us we stopped and had a break for not only was Dave bushed but Joe and I were dripping sweat. Our shirts were absolutely drenched for although it was hazy, it was a very warm close day. Probably the warmest for months in a dismal British summer. We sat for a while and I helped a group of walkers off their prescribed route. Oh to be adventurous, that's what I say. On reviewing the map I rushed down to them and pointed out a stile to the west, the direction they must continue to follow. Once our break was complete we set off in the direction I had sent the previous group. The walk across fields took us towards the Rowter Lane bridleway. It was packed with groups of walkers. There was going to be a busy time ahead of us saying hi and hello to fellow walkers, at least until we reached Mam Tor, for it was for Mam Tor that all the hoards were making their destination. Passing courtesies along the way we walked down Rowter Lane and crossed the Castleton road near to Oxlow House. Then it as across Windy Knoll to another road crossing before climbing quite sharply to a hill road. 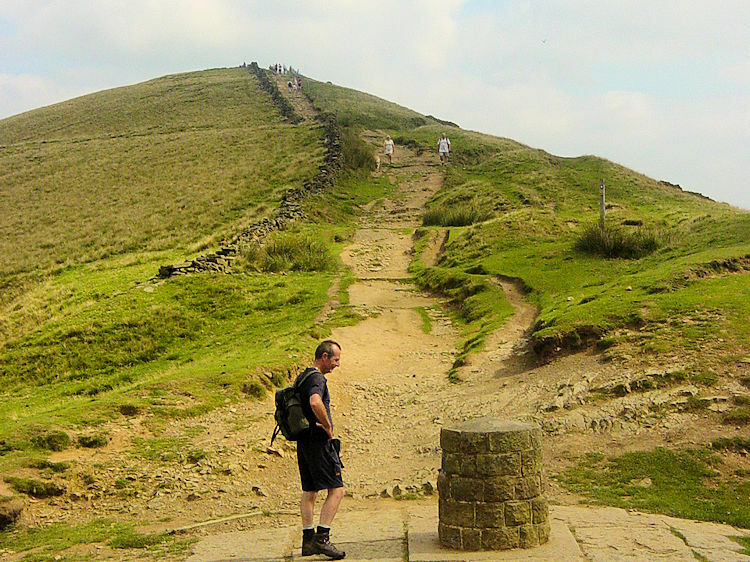 From this point it was an even steeper climb up steps to the top of Mam Tor. It was here Dave gave up the ghost and decided to walk into Castleton. The three days of pain had worn him down and he rightly decided enough was enough. He knew where we were going and left us to continue on unrestricted. We would met him in Castleton at the end of the walk. 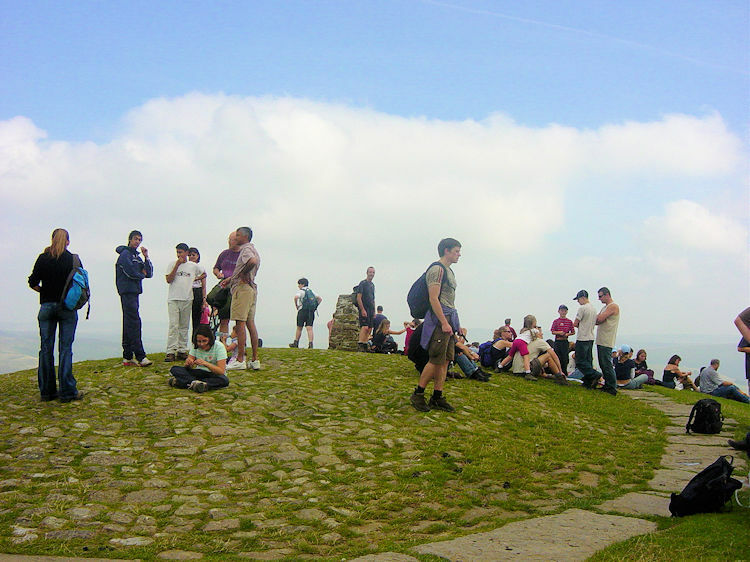 The three remaining amigos climbed to the steps to the top of Mam Tor. 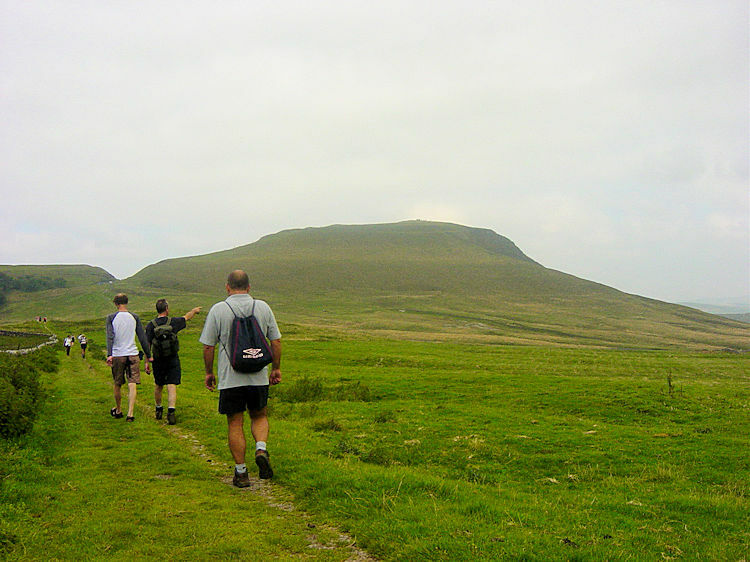 Here we were greeted by scores of walkers who were enjoying the great views. We sat some way from the throng on the crest of the hill and watched our stricken colleague toil on his walk towards Castleton. As we took our break we were entertained by a group of hang gliders preparing for action. We left before they could get airborne and walked along the spectacular ridge to Hollins Cross. On the way along the ridge two chaps were eating lunch while being hassled by sheep. One of the chaps said "the sheep are old friends, they never forget past acquaintances!" After sharing the humorous moment we walked on past Hollins Cross towards Back Tor. 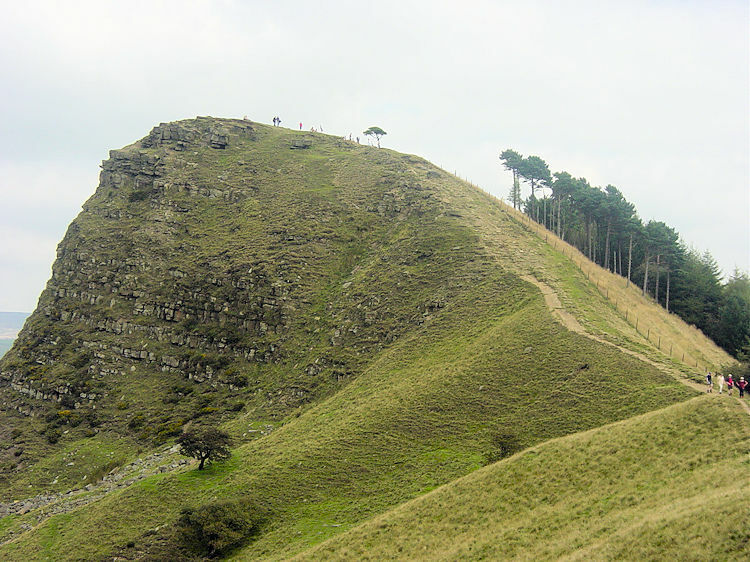 Back Tor is an impressive sight as it stands high in front of you all along the ridge walk from Mam Tor growing in stature as you get closer. We declined the climb to the busy top, favouring cutting through on the path to the south through Brockett Booth. Once though the tree lined avenue we crossed to the south of Lose Hill and stopped for another break. It was very hot now. As we took our break we surveyed the final section of the what I had originally planned for this walk, the ascent of Win Hill. It was a daunting assignment but one we would easily have done most times. However, we had to descend steeply first to Townhead and after our snack we strode and scrambled our way down the steep fall to the bottom. At the top Win Hill had looked a hot sweaty climb. At the bottom it appeared a very onerous task given the hot weather. We capitulated. Dave was already done, it was Sunday afternoon now and the park in Buxton was calling Steve. Therefore we called time on today's walking preferring to collect Dave and spend the afternoon in Buxton Park with the Sunday papers and ice cream. It had been a great walk though a gorgeous limestone pass followed by a scenic country crossing to an excellent ridge walk. Highly recommended, as many walkers will testify.